Posted in: BSU Journal Club. Tagged: exoplanets, Proxima Centauri. Figure 1 (left) and 2 (right) from Anglada et al. (2017). The right figure shows a zoomed-in version of the left figure. 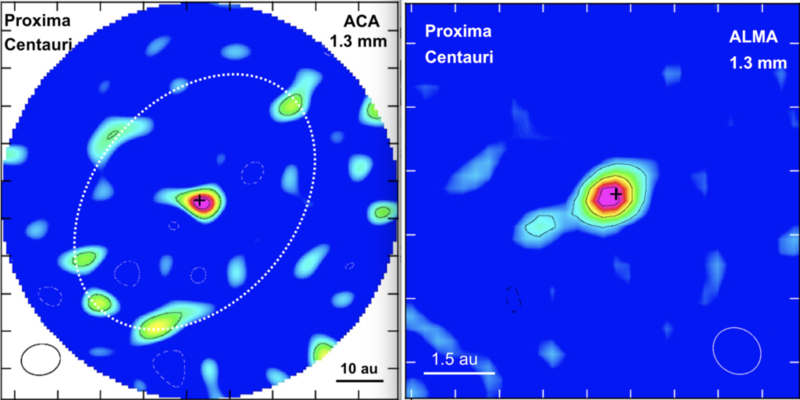 The rainbow blob at the center of the left figure is Proxima Centauri’s debris disk, and the white ellipse shows the possible outer disk. The greenish blob just to the left of center in the right figure is the mysterious source, possibly a ringed planet. In case you didn’t hear, late last year, astronomers confirmed a planet around our nearest stellar neighbor, Proxima Centauri, a red-dwarf star just four light years from Earth. The planet is probably about 30% more massive than Earth, probably making its composition Earth-like, and it’s in the habitable zone of its star, at a distance of about 0.05 astronomical units (AU) – all of which make it an exciting prospect for follow-up studies. And just last week, Guillem Anglada and colleagues announced the further discovery of a debris disk around the star. The left figure up top shows the image, in radio wavelengths, of emission from the disk – the disk appears as the rainbow blob near the center, and the location of the host star Proxima is marked with a black cross. The disk’s appears to orbit between 1 and 4 AU from its host star, which would put it between the Earth and Jupiter if it orbited in our solar system. However, since the red-dwarf star is so much smaller and cooler than our Sun, those orbital distances correspond to temperatures of only a few tens of degrees, making Proxima’s disk more akin to our Kuiper belt than our main asteroid belt. The radio light we see from the disk is mostly due to thermal emission from dust. 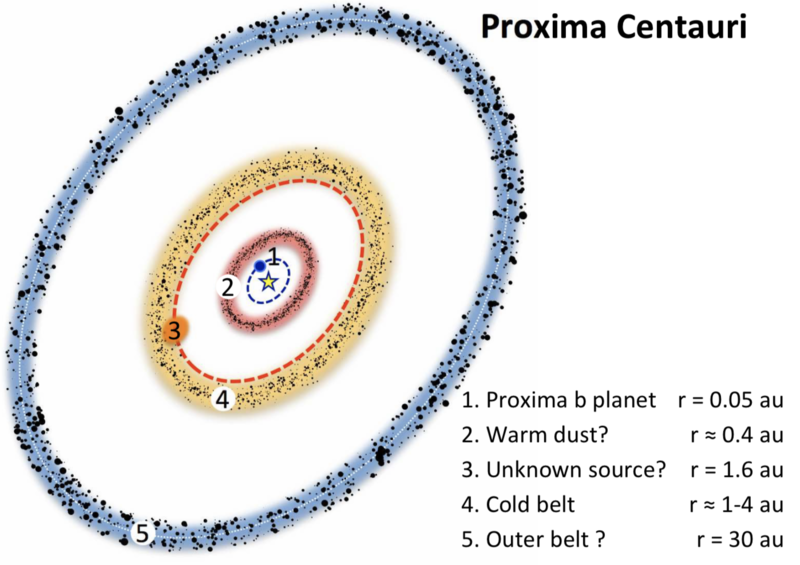 Using the above temperature estimate (and some other reasonable assumptions), Anglada and colleagues estimate (with large uncertainties) Proxima’s disk has about one thirtieth the mass of Ceres in dust and a lunar mass in larger bodies – almost as much mass as our Kuiper belt. There’s also marginal evidence in the data for a larger and cooler disk as well, perhaps 30 times farther from the star than the inner disk, and for something perhaps even more interesting. In the right figure above, see the greenish blob just below and to left of the rainbow blob? That (admittedly weak) signal could be emission from a ring system orbiting a roughly Saturn-mass planet about 1.6 AU distant from the star. The authors point out that there’s a small but non-zero chance that it’s actually just a background galaxy that photobombed their observations, a possibility that can be easily tested by looking at Proxima again in a few months. But if it turns out to be a ringed planet, it would be the first exo-ring system directly imaged (other systems show possible signs of rings). That would make Proxima an even more unusual planetary system since small stars tend to have small planets, and I’m only familiar with one other red dwarf star that hosts a big planet – NGTS-1 b, a red-dwarf hosting a hot Jupiter. But if there’s one thing that exoplanet astronomy has taught us in the last few decades, it’s to expect the unexpected. The diagram below shows the structure of the Proxima Centauri system suggested by Anglada and colleagues. Figure 4 from Anglada et al. (2017), showing the suggested structure of the Proxima Centauri planet-disk system.